I was recently inspired by a refreshingly simple and unvarnished blog on the The Inflexion Point for the IT Service Industry by Deepak Shenoy of Capital Mind. Where Deepak hits the nail on the head, is how IT services executives are promoting themselves out of relevance in the India-heritage firms (which is not too dissimilar from practices we observe in many Western-heritage services firms too). In plain terms, we've got lazy and arrogant, we've developed a sense of entitlement, where all we need to do is print money from the profits of maintaining legacy enterprise practices. The context here is simple: the enterprise services gravy train is slowing down for those executives who aren't staying ahead of the curve, and when India's largest and most profitable IT services provider TCS is looking to decrease its reliance on legacy labor, you know the tide is turning - and turning fast. Intense competition for low-cost offshore delivery is reaching its commoditization point, and executives need to decide whether to protect their dwindling turf, or re-invest in their own skills to make themselves more marketable and valuable to the industry. It's like going to a dentist and not being able to see a digital X-ray of your teeth? Would you keep buying services from someone who hasn't read a text book, or had some form of new skill development over the last decade? It's the same with business IT services - providers need to be able to do more than deliver the same old technology services and processes at scale - they need to introduce better ways of doing things. The development of new technologies, tools, process standards and capabilities are creating a whole new wave of possibilities for enterprises to get ahead. The technology/business services industry was built on complexity, where services firms profited massively on enterprises' need for skills they didn't possess, to develop technology apps and services, to design processes and better ways to do things. There was money to be made designing solutions - and also maintaining and tweaking them. In short, we've thrived on new innovations and disruptions for the last five decades... from mainframes to Client/Servers to ERP to web-based architectures to cloud computing. The only difference, today, is the pace of change and innovation is considerably more aggressive - digital technologies such as mobility, analytics and social are generating new business value when legacy business processes (and practices) are dragged into a digital business environment, while new developments in robotic automation platforms are making it much easier to create fluid workflows for operations to become more efficient. On top of that, add the possibilities of artificial intelligence, cognitive applications and advanced data science, and you have a maelstrom of immense change and new complexity challenging the status quo of corporate systems and processes. Have we really become this lazy... have we really become this bloated and content, that we don't have the energy to learn new technologies, new business standards and processes? Do we really think today's customers are going to spend their days on a valueless mediocre treadmill of maintaining legacy ERP products, persisting with poorly run process flows? While we can get overly excited about the emergence of robotics platforms and Digital solutions to create all sorts of disruptive possibilities for enterprises, without the skills to take advantage of them, they're not going to deliver much value for clients. All the smart service providers will be providing all the technology bells and whistles to compliment their global scale by the end of 2015. These are quickly becoming table-stake components of delivery, and we are already seeing several clients RFP responses in the field where robotic process automation (for example) is included. 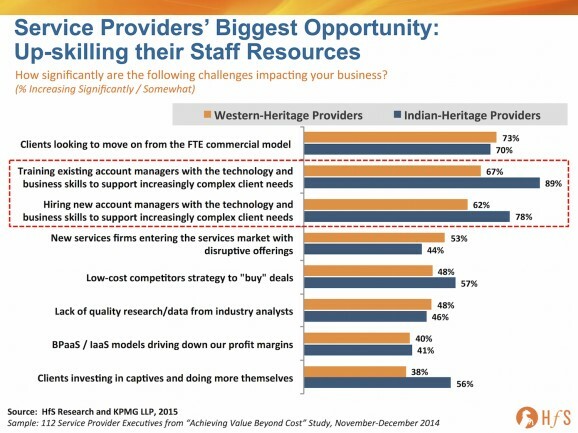 However, when the vast majority of Indian-heritage provider executives view up-skilling their account managers as their number one challenge, then this is a massive, massive issue. In fact, it's the biggest issue facing global services today. What they're really saying here is that they simply do not have the skills their clients are increasingly demanding and they are really struggling to either bring it in fresh (78%) of develop the ones the have (89%). But why can they not develop the ones they have? Because their legacy model of promoting staff to project manage teams of coders / transactional processors is leaving them with a skill-set completely unsuited to helping clients which need orthogonal thinking, analytical context and an ability to redesign processes. And while this critical challenge is clearly becoming a huge issue for the Indian-heritage firms, it's also besetting two-thirds of the Western-heritage providers, many of whom claim to boast superior consultative acumen. What's abundantly clear today is that proving scale, standard platforms and technology tools will only get you so far with clients. Without the bench of talent to enable clients to use these effectively, several providers are going to get quickly ejected from client engagements and relegated to providing transactional resources for the diminishing number of clients who only care about the low-cost legacy model. So if they can't hire in the talent or retrain what they have, then what, pray tell, is the answer here? Simple: create, partner or acquire consulting firms which can develop and adapt the right skills and methodology to make this work. There needs to be a coming-together of consulting and outsourcing service delivery, the likes of which we have yet to see at a broad scale in the services industry. It's clear the outsourcing culture fosters standardization and stability, not orthogonal thinking and creativity. Finding a way to bridge the two is what is key here - and it's not something that can happen overnight for many firms so embedded in their current cultures. "Have we really become this lazy… have we really become this bloated and content, that we don’t have the energy to learn new technologies, new business standards and processes?" Deepak’s article is bang on. This reminds me of an interesting analogy. So best scenario - Keep both your clients and employees happy, i.e. Clients get value for their money and employees work on interesting projects, gain skills and get better salaries. But the shareholders will have to adjust their expectations on quarterly stock movement as this is a front heavy investment. Worst Scenario - Shareholders don’t want to reduce their earnings and remain happy. Employees continue to get paid more without any skill development - happy in short term. And the poor client is stuck in a sticky T&M deal that was signed years ago. You are sitting on time bomb. Most probable scenario - Client forces you to get into a fixed price deal and is satisfied now. Shareholders don’t want to let go the returns and push management for more. It’s anybody’s guess what will happen to employees. Great article. Straight to the point. We have to stay ahead of the curve and help ou clients to get there. Thank you. This is an insightful reflection on the dilemma facing the business services industry today and it's absolutely the reason we set-up Symphony Ventures. For me there are several key issues faced by the industry at this time. Talent. There is a dearth of talent available that really gets the "as a service" concept and that understands that it's quite different from the people centric BPO model. The need to integrate technology in very different ways is a complete mind-shift that is alien to most BPO firms and might appear risky to the client community due to lack of knowledge and frankly evidence that BPO firms can deliver to these new models. As you say the skill sets are misaligned with those of running BPO operations. Investment. Having spent the last 20 years in the BPO sector, I can tell you that investment in the BPO world is a synonym for losses. There is a lot of talk but little action. It's confusing for clients because the BPO firms have very little to show and won’t make big moves without clients funding them. Clients want to see the drive toward digital transformation but also want to see guaranteed returns to justify the hefty margin that BPO players will need to charge to maintain their bottom lines when their top line is under threat by these new digital delivery models. Consultants. As you rightly state, consultants who have the right blend of skills around technology, process and outsourcing will, in my opinion, rule the roost for the next couple of years. Just as early BPO deals sprung out of the big 3 consulting firms, these new digital business models will spring out of a new breed of consultants. These firms will have the BPO heritage and understand the need for enterprise and process rigor, but at the same time are able to analyse, present and implement extremely favourable business cases to enlightened clients without the friction of conflicts with existing services, BPO overheads and fear of lost margin to the BPO divisions. My (rather biased) advice to clients is to keep it simple get the best independent advice available and then decide how and who to work with to generate the significant benefits the new "as a service" model will deliver. Phil - excellent insights. Agree there needs to be a more blended delivery model to provide more consulting skills for clients, but can most of today's consulting firms really deliver digital transformation? If services suppliers are struggling to hire the talent, surely the consultants are too? Best article on the future of services industry I have read in a long while. The talent war among the providers is at fever point! "Consulting firms know how to make money out of corporate complexity and insecurity, while outsourcing providers are very good and developing sticky delivery models to manage their clients’ processes and operations"
Great stuff, Phil. How do you see the impact of RPA this year? You mention it a lot, but is the capability there yet? The capability to deliver RPA is there now in a great many service providers. All 20 of the service providers in our recent HfS Robotic Premier League are capable of delivering this capability to their clients today albeit perhaps not all clients as they continue to scale up the internal resources necessary to solution and deliver RPA effectively. It's a given that people need to stay current with continuing education. That's true whether you are a doctor, teacher, or a software engineer. But a lot of people also know that the boom times are ending -- the large Indian companies have already indicated they'll purge large numbers over the next few years. Then again, so what? Colleges and companies in emerging markets have a finely tuned antenna for the next big thing. Just as colleges prepared a generation for work in IT, they will quickly pivot and prepare future students for the next opportunity -- be it tourism or bee keeping. I don't disagree that capability in service providers is developing in RPA. We can debate the extent to which that is a strategic, tactical or reactive development. However, RPA is only one component when comes to designing and implementing a digital strategy comprising "as a service" elements. The opportunity for the business services sector is to embrace the opportunity by driving real value impacting the top line and bottom line of clients with all of the 'future of work' components including SaaS, AI, mobile, crowd, impact and many others. Good early baby steps with RPA but I'd argue that BPO is not embracing or driving developments in the "as a service" economy. Thanks for the link and the excellent post Phil! What I really liked was "It’s clear the outsourcing culture fosters standardization and stability, not orthogonal thinking and creativity. 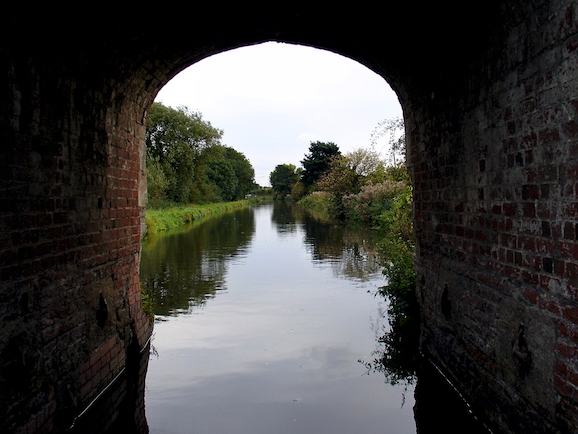 Finding a way to bridge the two is what is key here – and it’s not something that can happen overnight for many firms so embedded in their current cultures." There is a conflict though. I used to run an IT consultancy on a technology called Delphi, and we acquired a lot of deep knowledge and skill. The larger IT firms would search and find us as providers, but relationships were incredibly difficult because a) customers would want to talk to us directly once they knew who we were and what value we brought in, which scared away the big IT folks, and b) certain IT giants would only want to use us in the client acquisition process, meaning pre-sales and creating of prototypes at a low cost, keeping the meat of the work for themselves and shunting us out. As long as there is no trust deficit a partnership can work. This is a great idea, and I hope we see more of it; the efficiencies can be really big for a customer/project. So its not purely a 1:1 but I think the three levels of my RPA Maturity Model (1-Initialization, 2-Industrialization and 3-Institutionalization) are trying to get at how tactical to strategic service providers are being with regards to how they envision and deploy RPA today. Based on where the market is relative to that model I would say that we are largely tactical today while laying the groundworks for making it much more strategic. But as you said quite rightly, this is just one component of transforming from the "analog" past of BPO and into a "digital" future and as much progress as is being made on RPA over the last 12 months many of those other components are taking more time to set root across the service provider community. I suspect we will see a few of those other areas develop in 2015 with the same sort of vim and vigour that RPA did in 2014. Absolutely agree with your comment about “IT biggies using small niche firms but keeping the majority of the moolah for themselves”. I feel Mr Murthy would have said the same words in 1980s. Infosys started in the shadows of bigger American firms as subcontractor and when the customers knew who was actually doing the work, they came to Infosys. It sounds a bit idealistic, but the point is - if you have a value proposition, it’s only a matter of time when the non value adding middle men will get filtered out. True in most markets – Be it consumer goods or IT services.